Spacewalk enables you to inventory your systems, manage configuration, act as central repository for your systems, monitor your systems and so on. You can choose to use PostgreSQL or Oracle Database XE (Express max 3GB database) database. I have been using Spacewalk with PostgreSQL for some time now and am quite happy with it. I currently have subscribed 40+ Linux systems in mixed distributions (CentOS 5, 6 and Oracle Linux 5, 6) and it works OK. I wonder how Spacewalk manages in environments with 100+, 200+ systems… In this post i will explain how to install Spacewalk with PostgreSQL on CentOS 6. Spacewalk configure script checks /usr/share/pgsql and /var/lib/pgsql locations (default PostgreSQL install location on CentOS) for disk space availability (< 12GB). You need to make sure more than 12GB of free space is available at these locations! You can solve this by creating a large root partition or to create new mount points with more that 12GB of free space. 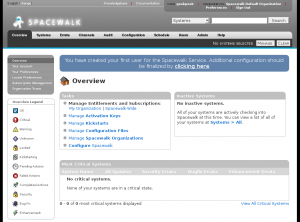 Let’s Install Spacewalk on CentOS 6! 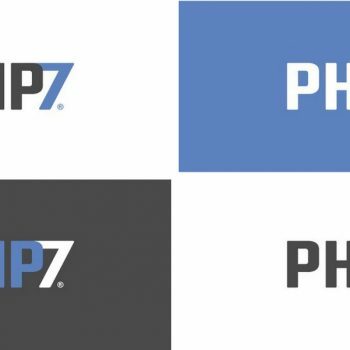 For this guide SELinux and iptables were disabled and CentOS 6 was fully updated! 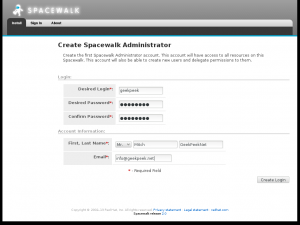 In this guide we will be configuring Spacewalk to work with PostgreSQL database. Spacewalk has prepared automated install of PostgreSQL. It is simple, efficient and fast – the obvious choice. Run spacewalk-setup in disconnected mode and enter the information it asks you for. Cobbler requires tftp and xinetd services be turned on for PXE provisioning functionality. Enable these services [Y]? 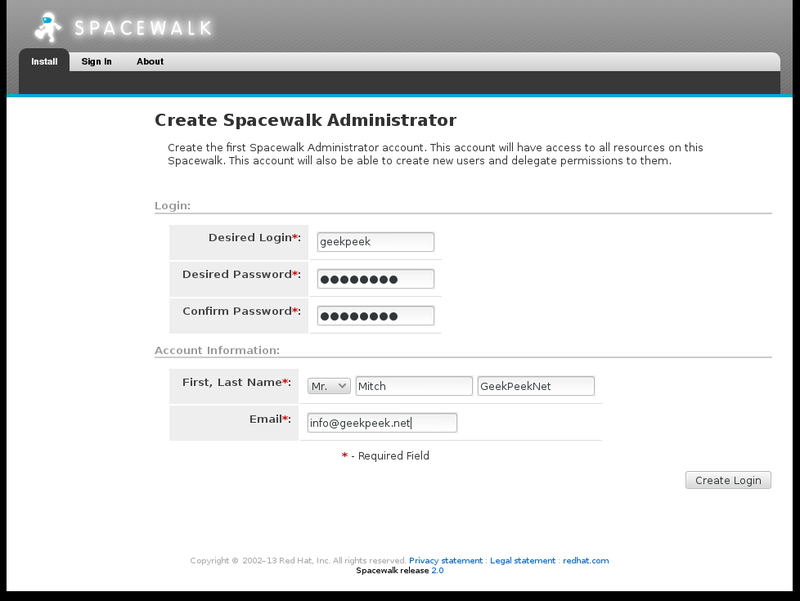 Visit https://foo1.geekpeek.net to create the Spacewalk administrator account. Please visit https://hostname.domainname and create Spacewalk Web Administrator user. Click “Create Login” and voila! You are inside your Spacewalk instance. 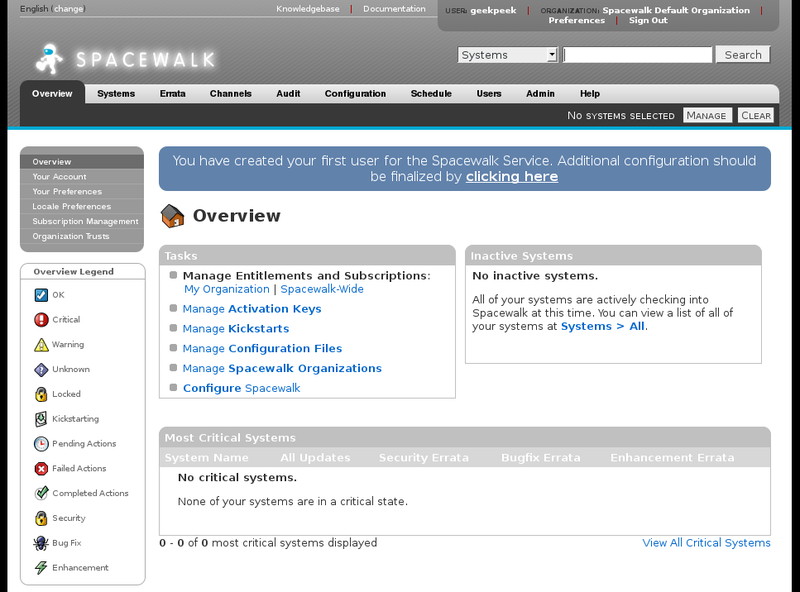 Now you need to add your systems in your Spacewalk Management, create Software Channels, Repositories, Configuration Channels and so on… We finished our “Install Spacewalk on CentOS 6” guide! Nice article. I’m going through the same thing right now and gearing up to start a non-profit and take donated computers, load them with Fedora and distribute to children who need them… as well as teaching computer classes. I look forward to more posts. Also, you don’t need to disable SELinux… Spacewalk is SELinux friendly. 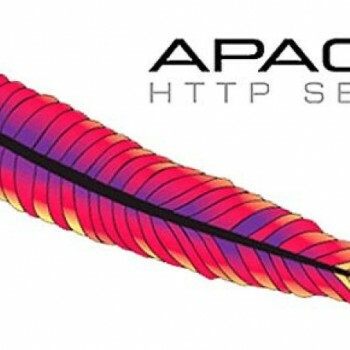 what about configuring / registering the clients ? osad ? or uploading contents to the server ?? FYI, I also had to add the EPEL repo, otherwise the install failed on unresolved dependencies. I was using a vanilla CentOS image at AWS. Hi Mitch , Thank you very much for overview and installtion for space walk, I want to learn more about space walk could u please share more information. can spacewalk be used for patching Ubuntu as well ? 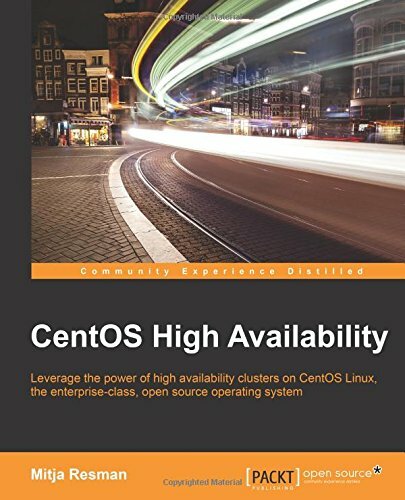 Can I manage different OS like RHEL,CentOS,Ubuntu from same Spacewalk server ? For production systems it’s generally not a good idea to blindly disable iptables. What would the necessary ports be to have this solution running? Actually i am using puppet for these, that’s more better. I must be making an error, when i run yum -y install spacewalk-setup-postgresql i get an error saying no pkg available so i do a yum list spacewalk* and non is listed i do see the spacewalk-repo-noarch. in yum repolist i see the repos are in yum.repos.d and it did update the Metadata did the project go south?